Shift Ctrl Art is now mobile friendly! I switched over to the new design a couple of days ago and I am still tweaking here and there. I am trying out a new blog design without a left or right hand bar to really have a minimalist design. I hope you like it as much as I do. I thought I would celebrate the new design with something unexpected: A new blog post! So here we go. When we made over our master bedroom in November, one of the projects we took on was making an IKEA built-in on the wall across from the bed. Above it, we installed a TV. The cables that connect the TV to the outlet and cable box in the cabinet below are hidden in the wall. We used the same approach as when we installed the wall hung TV in the kitchen which you can read about here. The difference between the kitchen and master bedroom, however, is that as you enter the master bedroom from the hallway you have a direct sight line to all the cables behind the TV itself. See image above. Not a pretty look. Here is the wall with the built-in and you can see here how we enter the room from the right, with a direct sight line to the back of the TV. We used some 1x4 lumber and cut it to size and built a simple U shape. We drilled three large holes at the top for any heat to escape through. We painted it a matte black. Our TV is an LED TV which does not get hot. This lightweight U shape simply slides down the back of the TV and rests on its plastic ledges on the back. Side by side - before and after. This is what it looked like when we first put up the gallery wall. This was before we installed the outlet and the HDMI cable outlet in the wall. And here is the wall now with the TV installed. I strategically placed black frames in the upper left and right corners on the gallery wall to offset some of the blackness of the TV. 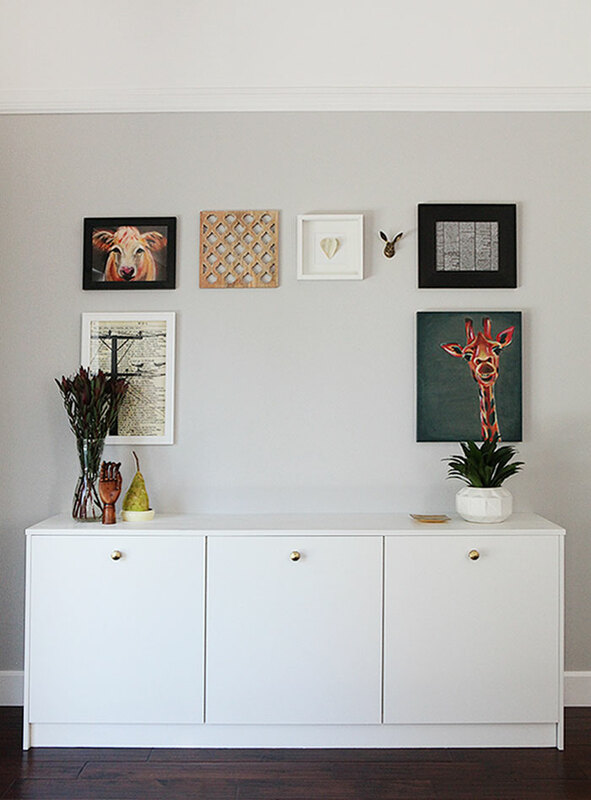 Cow, wooden tile (Similar here), heart art, black paper with white type (7Gypsies - old), birds on a wire poster (old), giraffe, green vase, votives (IKEA - old), gold dish (Target - old), white geometric vase, white cabinets, gold octagonally faceted knobs. This article: Hide the cables behind a wall mounted TV first appeared on http://ahomefordesign.com.